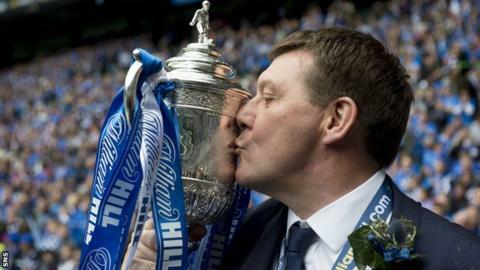 St Johnstone hope to agree a contract extension with Scottish Cup-winning manager Tommy Wright win the next couple of weeks. The 50-year-old, in his first season in charge in Perth, has another year of his current deal still to run. But the Northern Irishman has made it clear he would like to extend his stay. "We'll just sit down with his representative and thrash out a few details and get it down," chairman Steven Brown told BBC Scotland. "That will be completed hopefully in the next couple of weeks." Former Newcastle United, Nottingham Forest and Manchester City goalkeeper Wright became St Johnstone assistant manager in 2011 and was promoted when former Northern Ireland team-mate Steve Lomas headed for Millwall. In his first season in charge, Wright's side finished sixth in the Scottish Premiership before beating Dundee United 2-0 at Celtic Park on Saturday to lift the Scottish Cup for the first time. Brown revealed that he had an initial chat with Wright "a few months ago" about a new contract. "He's quite happy to stay and I'm delighted he's going to stay," said the chairman. "He creates a lot of stability in the club, his tactics are great, and he's a great guy to spend time with. I can't ask any more of him. "When you appoint a manager, there's always that gamble. "He's been a manager in his own right over in Northern Ireland, but this is a different stage, a different level and I can't fault him, he's been absolutely exceptional." Wright, who was boss of Limavady United, Ballymena United and Lisburn Distillery, was enthusiastic about the prospect of a new deal with the Perth club. "I've been quoted that I'm more than happy to stay here," he said. "I feel privileged and honoured to be given the job and there is scope in the contract for it to be extended. "So the chairman has indicated that and talks will probably start very shortly, but I'm happy to stay here as long as possible." Meanwhile, Wright is hopeful that winning the Scottish Cup and participation in the Europa League qualifiers will help him retain his best players, including Scotland Under-21 striker Stevie May. "We've worked through the squad and probably have more signed up than we have over the last two seasons," he said. "Stevie May is contracted for next season anyway and he has indicated he wants to extend that, so that's a plus for us and hopefully a deal can be done in the next few weeks. "We did make history by being the first St Johnstone team to get to the final, but that was not enough. "We wanted to be the first to win it and, thanks to the players, they've achieved that and we've got this wonderful trophy now."